The Heritage Foundation of Newfoundland and Labrador (HFNL) will be celebrating national Heritage Day on Monday (February 16th), at 10:30 a.m., at The Suncor Energy Fluvarium, 5 Nagle’s Place, St. John’s. Mr. Kevin Parsons, MHA for the District of Cape St. Francis and Parliamentary Secretary to the Minister of Business, Tourism, Culture and Rural Development - along with representatives from the education and heritage communities and municipal and provincial governments - will join HFNL as the winners of this year’s provincial Heritage Places Poster Contest are announced. Over 1000 students from 50 schools across the province produced submissions for the contest. This contest was open to all schools in the province, and was organized through HFNL. The winning submission is featured on the Foundation's poster promoting Heritage Day in Newfoundland and Labrador. 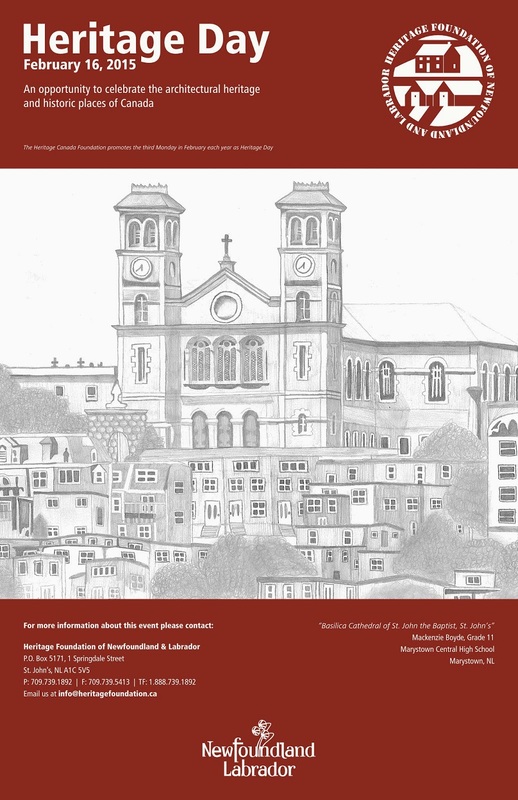 Mackenzie Boyde, a grade 11 student at Marystown Central High School, Marystown, submitted the overall winning submission – a depiction of the Basilica Cathedral of St. John the Baptist Registered Heritage Structure and National Historic Site in St. John’s. Junior High – Nathan Corrigan, Grade 8, Stella Maris Academy, Trepassey for his depiction of Cape Spear Lighttower Recognized Federal Heritage Building. Judges for the event included Margaret Walsh Best, artist and art educator; and Debra A. Barnable, visual artist and consultant. Please visit our website at www.heritagefoundation.ca to view the winners. The Foundation is also encouraging municipalities and heritage groups throughout the province to celebrate their heritage by holding a Heritage Day Proclamation and calling upon their citizens to celebrate their rich and diverse history. Heritage Day is celebrated on the third Monday of February each year. It is an opportunity to explore the past and to discover what shaped our communities and our history. The Heritage Foundation of Newfoundland and Labrador is a non-profit organization which was established by the Provincial Government of Newfoundland and Labrador in 1984 to stimulate an understanding of and an appreciation for the architectural heritage of the province.